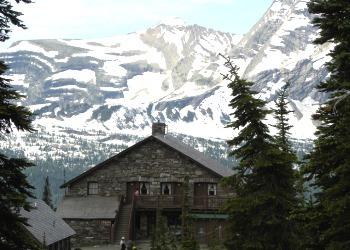 Granite Park Chalet is located in the heart of Glacier National Park in the U.S. state of Montana. The chalet was built in 1914 by the Great Northern Railway and is a National Historic Landmark contributing property, being one of five structures in the Great Northern Railway Buildings district. From Logan Pass along the Going-to-the-Sun Road, the chalet is a moderate 7.6 miles hike along the famed Crown of the Continent Highline Trail, usually referred to simply as the Highline Trail. Much of the trail passes through the scenic Garden Wall section of the park, immediately west and parallel to the Continental Divide. The chalet is also accessible via the Loop Trail (4.0 miles, 2,200 feet elevation gain) and the Swiftcurrent Trail (7.5 miles, 2,300 feet elevation gain). The trails are for hikers and horseback riders only; no vehicle access is provided. No silverware or dishes are provided. Environmentally friendly paper plates and utensils are available for optional purchase. Limited refrigeration may be available on a first come first serve basis.